SFFaudio – Page 912 – News, Reviews, and Commentary on all forms of science fiction, fantasy, and horror audio. 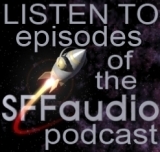 Audiobooks, audio drama, podcasts; we discuss all of it here. Mystery, crime, and noir audio are also fair game. Internet radio is growing more popular and there are several science fiction and fantasy related talk shows out there. My favorites are I-SCI-FI and Hour 25. Hour 25 is a great interview show. The guests are mostly science fiction and fantasy authors, with an occasional science guest. Warren James, a huge fan and voracious reader, insightfully interviews the guests, which include many of the top writers in the field. They’ve got a huge archive of past shows here. The website is a treasure trove of information, too – resources on each guest is provided. If you want to sample some shows, go to Cosmic Landscapes which is a Live 365 station carrying several science fiction talk shows in rotation. They currently feature Interstellar Transmissions and Sci-Fi Overdrive (Boca Raton, FL); Destinies: The Voice of Science Fiction (Stony Brook, NY); Hour of the Wolf (NYC); Shockwave (Minn, MN); Radio Sci-Fi (Orlando, FL); The Six Siders (Salinas, CA); The Warp Zone (Wichita, KS); FanBoy Radio (Fort Worth, TX); I-Sci-Fi (Salt Lake City, UT); Sci-Fi Talk (NYC); and DragonPage (Phoenix, AZ). Locus Online reports that Robert J. Sawyer’s weekly radio column Science FACTion: The Cutting Edge of Science has been picked up as a regular weekly feature by CBC Radio after a successful eight-week test run. The column consists of Sawyer’s three-minute commentaries and will be heard on local CBC morning shows across Canada, starting July 1st 2003. It’s possible that the CBC Radio website will carry the commentary – if that’s so, we’ll let you know. Audible.com is publishing some excellent science fiction and fantasy on audio. Earlier this year, they put out three collections: The Best of Asimov’s Science Fiction Magazine 2002, The Best of Analog Science Fiction Magazine 2002, and The Best of Fantasy and Science Fiction Magazine 2002. I reviewed all three titles for SF Site and enjoyed them all. My clear favorite, though, was the Fantasy and Science Fiction collection, so I was very pleased to see them follow up with two more titles: The Best of Fantasy and Science Fiction Magazine, January-February 2003 and The Best of Fantasy and Science Fiction Magazine, March-April 2003. The stories are all unabridged, and each collection runs five to six hours. Over the past two or three years, I’ve experienced a growing appreciation for short-form science fiction on audio. Unabridged novella and novellette length stories make the finest audiobooks, in my opinion, and there is a lot of good science fiction and fantasy out there at that length that has yet to be recorded. I’ve got a copy of The Best of Fantasy and Science Fiction Magazine, January-February 2003 and have listened to the first story, called “Anomalous Structures of My Dreams” by M. Shayne Bell. M. Shayne Bell is an intensely emotional writer. All of his stories I’ve read to date have been memorable – he really makes me feel. His website is here. It hasn’t been updated for a long while, but you can read “Lock Down”, one of his best. The site also has his essay A Defense of Science Fiction and Fantasy, which is worth a read. I’ll revisit these once I get them heard… but I hope they continue to produce these titles. Current science fiction and fantasy audio by great writers, right there for the grabbing. See all the Stoker Award nominees here. The awards will be presented at the HWA Annual Conference and Bram Stoker Awards banquet in New York City at the Park Central Hotel on the evening of June 8th 2003. Renting audiobooks is a cost-effective way of getting your hands on some very good stuff. How does it work? With most of the companies listed here, you select a book or two that is sent to you in a self-addressed stamped box. Usually you keep the book for 30 days, after which you put the book back in the box, tape it closed, then drop it in a mailbox. There’s no need to add postage, because it’s already paid. Some of these companies allow you to set ship dates for the books you select so that you can order several at a time, and have them arrive every two weeks or so. Blackstone Audio has been doing more and more science fiction and fantasy lately. The narrators are generally good. Some of their latest include Jack Williamson’s The Humanoids and a collection of short stories by Robert Silverberg. They also carry some audio drama, including an adaptation of Homer’s The Odyssey that I’m eager to hear. Books on Tape has an unabridged science fiction collection that’s highlighted by Isaac Asimov’s entire Foundation series and by Frank Herbert’s Dune series (including unabridged versions of the recent prequels written by Brian Herbert and Kevin J. Anderson). There are a few short story collections here as well. Recorded Books has the biggest collection of quality science fiction and fantasy, it’s getting even larger. Their narrators are the best, including Frank Muller, George Guidall, Rob Inglis, and Richard Ferrone, among many others. They’ve got some great titles, too. To name a few: Kim Stanley Robinson’s Mars trilogy, Tolkien’s Lord of the Rings, several Robert A. Heinlein titles, Piers Anthony’s Incarnations of Immortality series, and Octavia Butler’s Parable of the Sower and Parable of the Talents. Doomsday Book and To Say Nothing of the Dog by Connie Willis are also here, along with many other good titles.